One of The Blot’s favorite new comic book series is Terry Moore’s self-published indie comic, Motor Girl! As Terry describes Motor Girl, the series “introduces you to Samantha Locklear, a war veteran who has come home to work in a desert junkyard with Mike, her constant companion, who also happens to be a gorilla. Whether or not Mike is real is up for you to decide, but that’s just page one, before the UFO crashes into their yard one night.” If you haven’t read Motor Girl yet, go pick up the book’s first trade paperback “Real Life” now, which collects issues 1-5 of the series. If you have been reading the comic book (or even if you haven’t) you can now purchase the very first officially licensed Motor Girl t-shirt! 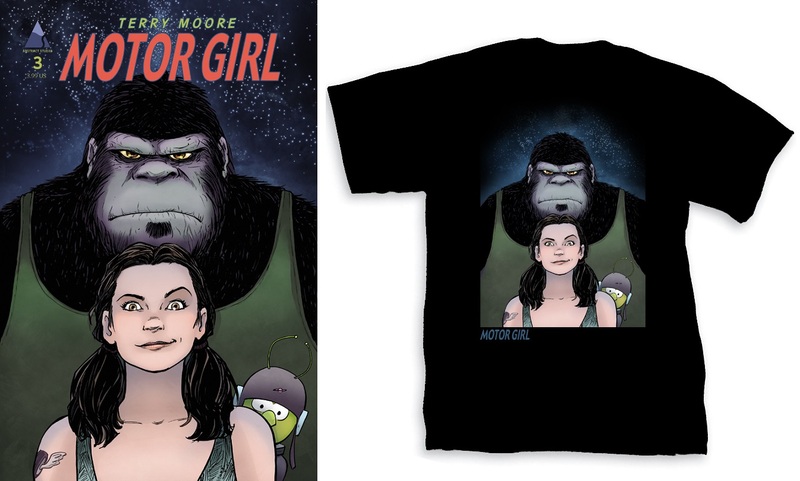 Produced by Graphitti Designs and featuring the cover artwork of the series’ 3rd issue, the Motor Girl t-shirts is available now, in sizes S-3XL, on a black tee at your local comic book store or directly from Terry Moore at the Abstract Studio online store for $17.99-19.99.